The concept of having a High Tea in the rustic and tranquil setting of an Australian Rainforest, is a novel one. The added interest of combining a sculpture exhibition and music with it makes it unique to the Central Coast. 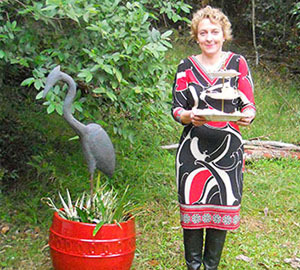 Emilia Krumm will be hosting Tranquility High Tea with Sculpture Tour, Music and a monthly Guest Artisan in the main pergola of the Forest of Tranquility on the last Sunday of each month starting from last Sunday in September each year. There will be a selection of teas on offer served with a variety of sweet and savoury treats. The cost is $35 per head and that includes access to the Forest. An opportunity to peruse the wonderful sculptures on exhibition, original gentle music played by Nature’s Beat along with the chance to relax, unwind and enjoy the Tranquility. Please come and join us, but don’t forget to book online first! Creating sculpture starts with a source deep inside me, where a wealth of experience has shaped who I am. A retrieval of fading memories of my cultural heritages: South African, Italian and Australian fuse to find form, to translate my experiences into the physical, becoming tangible and present and something treasured. Integral to experiencing my cultural traditions is the importance of nature, the diversity of flora and fauna and yet the fundamental similarities. For example with my sculpture Symbiosis the message is all about shapes that feed off each other yet nurture each other too. Working with reinforced resin, Perspex and stainless steel, my work seeks to develop a ‘Chiaroscuro’ effect which enhances the modelled forms and gives them depth resonant of the Renaissance period. The use of negative and positive spaces fascinates me and creates a particular kind of tension in my sculptures. The colours chosen are a reflection of the Australian and African natural abundance. This requires experimentation with finishes particularly for the reinforced resin which is always a challenge to guise. My Italian heritage combined with my African upbringing and life in Australia has had a Symbiotic effect on my work. I have found familiar inspirations in all these countries that resonate in natures’ organic shapes and forms.